When we celebrate Canadian cultural occasions, I get books on the topic to warm my kids up to the idea. But when it comes to Japanese occasions, I don't really have the option of getting a copy of Franklin Throws Beans (for Setsubun) or something like that. I would love non-fiction picture books in English about these holidays. However, when looking for something for 7-5-3 which was last week, I found the book Japanese Celebrations (CAN, JP, US) by Betty Reynolds. 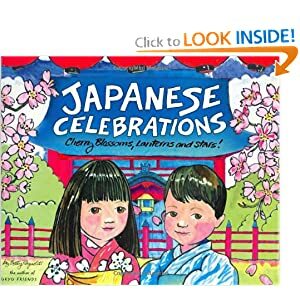 This is a great introductory book for children to Japanese celebrations, from Oshogatsu (New Year's) to 7-5-3 and everything in between　(including some neither I nor my husband knew about, like Kanbutse, Buddha's Birthday). The illustrations are great, really cute without going overboard (a real possibility in Japan!). This book is aimed at older kids but I think that like mine, those with a background in Japan could understand it from an earlier age as a read-aloud book. I do have to say, that I was somewhat annoyed at the errors in the Japanese text. The hiragana for monkey and sheep (saru and hitsuji, respectively) were mixed up, and they accidentally translated row (a boat) as fight. I wouldn't use this as a Japanese language introduction for a child. I got this from the library and I don't know if a newer version would have corrections or not. I submitted this post to Nonfiction Monday, which is being hosted by Books Together this week. That's really a shame about the mistakes in the Japanese - it looks like a great book otherwise. It is indeed! I hope they correct it in future editions. I'm glad you've joined the Nonfiction Monday roundup. Welcome! You were very gracious with your book review. The incorrect translations would have ruined the book for me! I surmise that the translator was British, as they use "row" for argument. I suggest that you contact the publisher. I will indeed contact the publisher, that's a great suggestion. Yes...contacting the publisher will get these annoying mistakes corrected in future editions. The book sounds charming, though! I've bought quite a few of her books for my niece over the years. I'm trying to get her interested enough in Japan to come and visit me when she's old enough. I think they are generally quite fun, although I think my husband noticed a few mistakes too. My Japanese isn't that good so I didn't! I love Betty Reynolds Boojs. We also really love Tokyo Friends. I appreciate how she includes Japanese words with phonetic pronunciation and kanji.